One will think they are heavenly. Other flowers are so ugly beside you. They look like fires instead of flowers. Why do you blossom for me especially? Who is your favorite in the past? I�d like to drink with you. For I forget to take a band with me. The story goes: long, long ago, the king of the ancient Shu Kingdom, Du Yu, transmigrated into a cuckoo after he was assassinated. The bird always sang bitterly, and it did not stop until blood came out from its bills. In each April, when the air is full of the cuckoo�s whines, azaleas are in blossom like flames. According to folklores, the cuckoo�s blood dyes the azalea flower into red; therefore, many poets in the ancient Chinese literary history chose to write such topics, such as �blood turns into flowers where cuckoo cries�; �the bright redness casts light on the Moon, and the Moon turned red by the wronged cuckoo�s blood�; �a mournful song sneaks into the building from outside, and it�s unbearable to hear such bitter cries�, etc. As a matter of fact, the national flower of Nepal, the Azalea, is the general name for many types of azaleas. Azaleas are generally evergreen or deciduous bushes; but we can see a few arbor or crawling azaleas by chances too. Azaleas have a long-standing history; they originated in the Cretaceous period (about 67,000,000 years from now) and scattered widely in the northern hemisphere. However, stricken by the drought in the Tertiary period and the glaciers of the Quaternary period, azaleas only survived in the eastern part of Asia. The Chinese people have been using azaleas as a medicinal material for quite a long time, which can be proved by many records in ancient Chinese medicinal books. The famous poet of the Tang Dynasty, Bai Juyi(772-846 A.D.), was quite fond of azaleas, and transplanted many azaleas in his yard. In the 18th century, a Swedish botanist, Linne, established Rhododendron in his book entitled �Records of Plant Species�(1735). In the mid 19th century, some British botanists had an expedition to the Himalayan Mountain areas, and they found many new species of azaleas there, which attracted the attention of botanists in all countries. Therefore, from the 19th century to the mid 20th century, the botanists of Britain, France, America, Germany and Russia, etc., swarmed to Southwest China and East China to investigate and collect various azaleas with 482 new types discovered. These foreigners brought these azaleas of Yunnan back and cultivated more than a thousand species. So up to now, people in the horticultural circles in Europe and America still believe that there won�t be any garden without flowers from China. Before the establishment of the New China in 1949, the Royal Botanical Garden in Edinburgh of Britain dispatched 7 teams consisting of experts and doctors in botany to the Yunnan province of China. Altogether, they collected more than 31,000 specimens and took away with them more than 6000 plant species, among which there are many types of azaleas. That�s why the Royal Botanical Garden in Edinburgh still use the azaleas of China as its major displaying flowers. On the mountain slopes of Mount Gaoligong in Tengchong, Yunnan, there is a huge azalea tree with a girth periphery of nearly 10 meters. 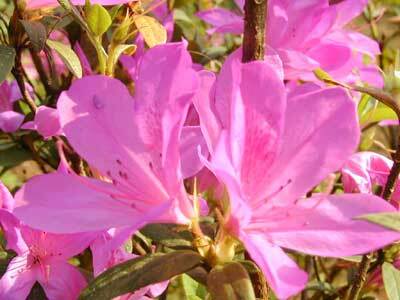 It is praised as the �king of azaleas in the world�. In 1919, a botanist of the Royal Botanical Garden in Edinburgh, Britain, cut down a huge azalea tree with a height of 75 meters, a girth periphery of 2.6 meters, and an age of 280 years. He sawed a section of the tree and made it into a piece of specimen. It was transported into Britain by way of Burma and India, and today is still lying in the Museum of Great Britain. Azaleas have many varieties actually; altogether, the varieties total to more than 900, among which Asia takes up 850 varieties, China has about 530 varieties, and New Guinea and Malaysia have about 280 varieties. Besides, North America has 24 varieties, Europe 9, and Antarctic 1. Nowadays, more than 800 varieties of azaleas are still in existence; among them, China has more than 460 varieties, among which Yunnan account for 420 varieties. China really deserves the honor - �the world center of azalea flowers�. Thanks to the backbreaking labors by gardeners for many years, azaleas have become a famed type of flowers on our planet.